Classes available for CEU credit through the University of Southern Maine. All classes are taught at The MacSmith's traning center at 917 US Route One in Yarmouth, or they can be brought to your facility through prior arrangement. Contact us to schedule a workshop at your school! Register for all three classes and receive a 10% discount! In this interactive workshop you will set up your own course with your classroom materials and assignments using iTunes U. iTunes U is a free application that allows you to create a course accessible to your students through their iPads containing your lecture materials, handouts, homework assignments, and any items that support the lessons such as videos, web sites, podcasts, imagery, etc. 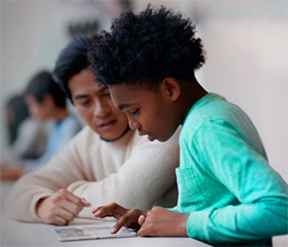 By inviting your students to join the class, your iTunes U course functions in a closed environment so that you can work with students directly. You’ll learn how to publish lessons to the class, post assignments, collect and grade homework, and interact with students individually or in groups. We’ll also discuss managing your course and collaborating with other teachers. Come to class with the materials, assignments, and links to resources that you use in class and we’ll help you to set up your first iTunes U course! iBooks Author for Teachers - Create Your Own Digital Textbook! Nearly every teacher has thought, “If I had written this textbook, I would have….” Well, now you can! iBooks Author is an application that not only lets you create a digital textbook but lets you include audio and video along with graphics and text. Using your own worksheets, presentations, photos, and other materials from your classes, you will learn to create a unique digital textbook suited specifically for your class that your students can access on their iPads. Once downloaded, they won’t even need an internet connection to use it. Apple’s App Store contains over 1 million apps. Teachers are busy enough as it is and don’t have a lot of extra time to evaluate which apps would be most useful to their students. This class provides you with a means to evaluate apps so that you can quickly narrow down the list to find which would work best in your classroom. We’ll use a number of existing apps across multiple disciplines as examples, introducing you to some new materials for your students and giving you ideas of what to look for as you search for effective teaching tools. These are classes from our last round. More class listings coming soon. Learn about important security and maintenance issues on your Mac as well as how to back up your files.